Dosai as it is popularly called in Tamilnadu is a staple breakfast dish in most homes. 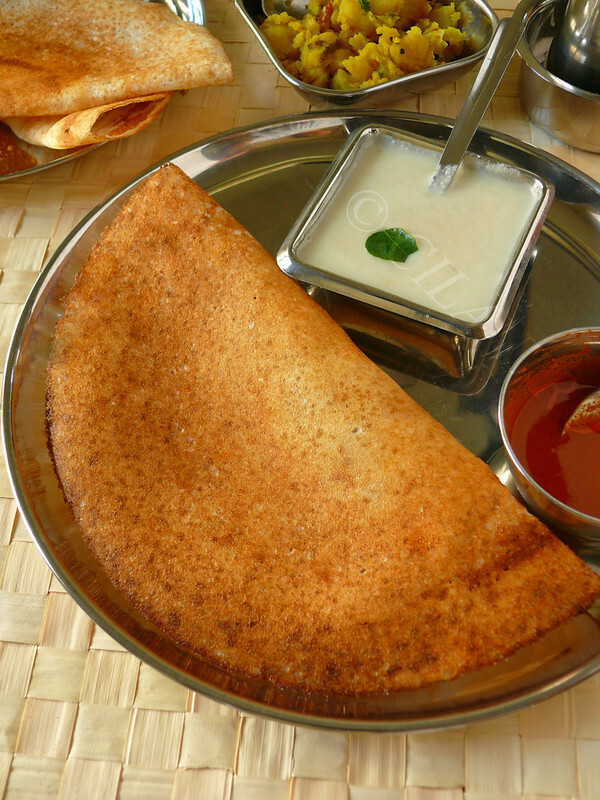 Dosai or Dosa or Dosé is a fermented crepe or pancake made from rice batter and black lentils. A reference to Dosa occurs in the Tamil Sangam Literature from around 6th century AD. Edward Farnworth mentions the first reference to Thosai in Tamil Sangam literature in the sixth century A.D. The Sanskrit classic Manasollasa written in 1051 AD by Western Chalukya kingSomesvara III describes dosai. Making the batter is time consuming process and I have given the procedure here. Making the perfect Dosai is an art by itself and it needs practice and patience. The right batter consistency, the griddle & its temperature and the art of spreading is all it takes to get the perfect Dosai. I have grown up eating and watching Amma making Dosai to such perfection that I can claim that she is the best Dosai maker in the whole entire world. Even today I eagerly wait for the fresh crispy Dosais that Amma makes during my visits to India. Appa is very particular about his meal time and as a matter of discipline, Amma made Dosais at a particular time and during school vacations if we did not make it at this particular time she refused to make them fresh. The Dosais would turn soft and I never liked having them that way. Now everything has changed, she waits until I arrive for breakfast and Appa has to wait for the moment ( I usually do not keep him waiting). Love you Amma!!! She serves it with my favorite Vengaya chutney and tons and tons of affection and love poured into it. I think I have perfected the art of making them from her. The Dosai series will feature different variations of Dosais made in most Tamil homes. To start with I have given the basic Dosai preparation today. The batter I use is the same batter that I use for Idli too. 1. Heat a cast iron on medium high heat setting. Sprinkle a few drops of water on the griddle, the water will sizzle (loud hissing noise) and evaporate immediately. This indicates the griddle is ready to make dosais. My stove takes 5 minutes to heat the griddle on medium high heat. 2. Pour about a drop of oil on the heated pan. 3. Evenly spread the oil with a small cloth, tissue paper or an onion cut into half. Now spread the oil around to coat the griddle (too much oil will make the batter stick to the ladle). 4. Now pour a ladle ( aprox 1/4 cup) of batter onto the center of the hot pan. 5. Spread evenly in circles to spread out the batter. 6. Drizzle few drops of oil evenly on the Dosai. 7. Allow it to cook. When the bottom side of the Dosai turns golden and the edges slightly turning brown and releasing itself, indicated it is cooked. Lift the Dosai off the griddle easily with a spatula. Fold one half over the other and serve with your favorite chutney. 8. Serve hot. Crispy Dosais are served one at a time. Munching on the crispy Dosais with Chutney or Sambhar is a treat by itself. Each one gets their share one at a time straight from the griddle be it my family or friends/guests. TIPS: 1. For a more traditional Dosai, a cast iron griddle is used and I have not got the same results in a non stick pan. The pan that I use is a seasoned griddle that my Aunt gave me. She specifically bought a Varppu kallu from Srirangam. It is so well seasoned that it acts like a non stick. I just wipe it clean after each use. If and when I wash it with soap, I immediately apply oil over it before storing it back in my kitchen. When making Dosai after the wash, apply a little bit more oil and make a thick Dosai first and then proceed to make the thinner one. This helps in coating the griddle well. Cast iron is naturally non-stick. Properly seasoned (see below) nothing will stick to it. Cast iron eliminates the need for the costly, toxic chemicals used to create the non-stick surfaces in modern cookware. Eco-easy clean up. All cast iron cookware requires for clean up is hot water and a stiff brush, so you avoid any harmful chemicals in detergent or solvents. Cast iron can take the heat. It can withstand much hotter temperatures and will distribute the heat more evenly than traditional cookware. And since it holds heat well, you can use less energy to cook. Plus it’s perfect for outdoor cooking. Just remember that cast iron gets hot. so use an oven mitt when handling a hot pan. It’s good for you. Cast iron cookware leaches small amounts of iron into food, so you get a little extra iron each time you use it. Almost anyone, especially women in their child bearing years, will benefit from this. 2. Soak a tablespoon of fenugreek in the batter recipe I have provided and grind it with the Ulluthamparuppu/Urid dhal. 3. The temperature or the heat in the griddle is most important. Adjust the heat accordingly after making the first Dosai. Too much heat will also make the spreading difficult and the Dosai will brown easily (almost burnt). Less heat will make it difficult to cook and the right color is not reached and it turns almost white. 4. 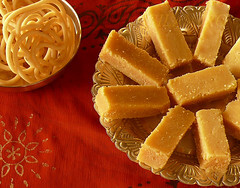 Clarified butter/ghee can be used instead of oil. Amma uses Ithayam ennai/Gingely oil. I have seen a broomstick being used to drizzle oil evenly over the Dosai in restaurants. 5. I have also been told that adding cooked rice or Aval/poha helps in making a perfect Dosai but I have`nt tried it myself. I welcome my readers to post their tips to making Dosais. 2. If your dosa sides curl up when cooking, add a pinch of bakig soda (not baking powder) and mix well just before making dosa. 3. If your bottom of dosa doesn't brown evenly or if the sides curl up while cooking, then it means you are using too much oil or the griddle is too hot, when this happens, splatter 2 tsp of water over the griddle and wipe it off with a tissue paper. The broomstick mentioned in this article is typical of tamilnadu idly/dosa stalls and they use that to spray water before making each dosa. The water helps cool down the top surface of the griddle there by it allows the dosa to spread evenly when pouring the batter and spreading. Too hot of a griddle will form steam pockets when pouring and spreading and that's why the dosa doesn't brown evenly. 4. If your dosa sticks to your pan, cut an onion in half and use that as an oil brush. 5. For whatever reason if you dosa doesn't come out good when your guests are eagerly waiting for dinner, add some pancake flour into the batter, add little bit more water (if needed) and you can make spongy (kal dosai) in no time. 6. Idayam gingely oil and dosa is a match made in heaven. A little below heaven comes ghee. If using ghee the pan has to be wiped off the griddle everytime before pouring the batter. 7. Cast iron pan is the key to the perfect crispy dosa. Amazon.com has it. The trick to season the pan for dosa is to heat the pan in oven upto 450 degrees for one hour, let it cool and then sand the inner surface using a machine sander (hand sanding takes a longer time but it can be done with time and patience) until its smooth when you run your fingers and then clean well and follow the manufactures instructions to re-season the pan. I have a perfectly seasoned 14 inch cast iron pan (also from amazon.com) and I make restaurant style big dosa at home. After using this new pan, I returned my Mom's 60 year old pan back to her. That pan was given to her by her mom as a wedding gift. As always, I experimented with most of the dishes you posted online. Tried all the chutneys (except Arjoon) and they are 100% authentic. Keep up the great work !! Delicious dosa,crispy and yum..thanks for the tips dear,useful post.. Very informative post. I love dosai and I am going to make some for my friends today. Dosai just makes me hungry!! nice one.. I love crispy dosai-s..
nice tips. dosa looks perfect and crispy. I never get right dosa. Wow lovely post...and perfect dosas! AWESOME... write up... hungry now !! Super crispy dosas, totally agree with u, making dosas is quite an art..
Nice tips and beautiful pictures! Beautiful clicks! Dosa is my all time favorite snack....! Will try to follow your tips! Yes, we can surely make thin crispy dosa without urad dal at home. Dosa is one of the most favorite South Indian recipes for people around the world. You can find a wide variety of dosa in the market and recipes online. According to my personal experience, this Ragi Dosa recipe with peanut and coconut chutney counts as one of the tasty dishes on my list. 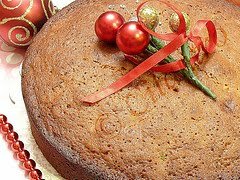 And I found this recipe on Living Foodz website.